I'm posting this one because I just bought this one. 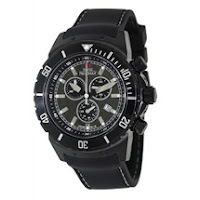 Newegg is offering this Swiss Precimax Pursuit Pro Men's Sports Black Silicone Chronograph Watch for just $70 . This thing's retail price is $725. That's crazy expensive, but I did the due diligence and the next best price (on Amazon) was $187. Did I mention it comes with FREE shipping? This cool, modern-looking timepiece has "an eye-catching carbon fiber-style dial, which is tastefully accented by sharp black details and highly-reflective hardware." It's got a scratch-resistant Sapphimax crystal and a screw-down crown for protection. Lastly, it's water resistent for 100 meters. Prefer the silver look to black? They have that one too for $77. Check it out here .